Axel W. E. Wismueller, M.D., M.Sc., Ph.D.
Dr. Axel W. E. Wismüller is one of the pioneers of Artificial Intelligence (AI) in radiology. 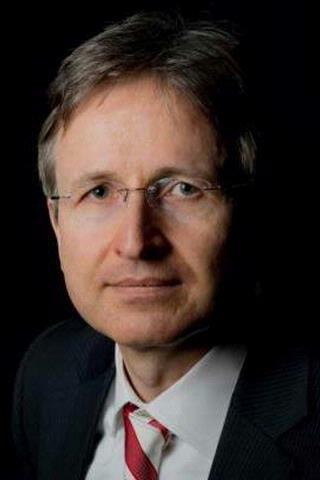 With a 25+ years outstanding leadership, funding and publication track record, he is one of very few individuals worldwide serving as both a clinically practicing radiologist and an internationally renowned scientist, thus bridging the gap between fundamental research and clinical application of AI in radiology. Dr. Wismüller is Professor of Radiology, Biomedical & Electrical Engineering. He is Director of the AI Radiology Laboratory at URMC. In his clinical practice, he serves as an Attending Radiologist for cardiothoracic and body imaging, including CT, MRI and ultrasound. Based on his dual professional qualification in both science and medicine, his funded research focuses on developing and clinically evaluating cutting-edge machine learning, AI and health informatics technologies to expedite patient- and provider-centered image interpretation, clinical understanding, and efficient health care management – with the overall goal to improve patient health and well-being. Dr. Wismüller holds multiple national and international patents for his inventions of novel machine learning methods. He is author of >220 peer-reviewed scientific publications, holds US and European medical licenses, US and German Board Certifications in Diagnostic Radiology, and a state doctorate (Habilitation) with adjunct professorship at Ludwig Maximilian University (LMU) Munich. Dr. Wismüller has recently been elected and honored as a Senior Member of the International Society for Optics (SPIE) for his outstanding contributions to AI in medical imaging. He has served as a founding faculty member of the Goergen Institute for Data Science. Dr. Wismüller is widely known for clinical applications of his research, which most notably include a system for automatic analysis of chest radiographs, imaging biomarkers for breast cancer and brain tumor diagnosis, bone stability prediction in osteoporosis, and imaging assessment of neuroinflammatory disorders, such as MS.
Dr. Wismüller attended medical school in Munich, with additional clinical training at Yale University. He received his MD degree from Technical University of Munich (TUM) in 1992, which included a scientific dissertation in neurology. In addition, he received a MSc degree in Physics from LMU, which included a master's thesis on machine learning. From 1997 to 2007, he completed his radiology residency and a fellowship in Diagnostic Radiology at LMU Medical Center, where he founded and directed an interdisciplinary research laboratory on AI in radiology. In 2006, he received a PhD degree in Electrical and Computer Engineering at the highest-ranked German engineering school, TUM, for a PhD thesis on a novel machine learning algorithm invented by him (XOM), for which he holds national and international patents. Dr. Wismüller has been the PI of a NIH R01 Award on exploring large-scale functional connectivity in the human brain. Supported by NIDA and its AIDS research program, the CRCNS program of the National Science Foundation (NSF), and co-funded by the German Research Ministry, this international project led to fundamental discoveries in the field of brain connectivity analysis, which were published in highest-ranked neuroradiology journals NeuroImage and NeuroImage:Clinical. As an active member of multiple societies in both medicine and engineering, e.g. ACR, RSNA and SPIE, Dr. Wismüller has served on numerous academic and administrative committees in both the US and Europe. He has successfully supervised scientific theses of >30 post-doctoral fellows, PhD and MSc students from engineering, computer science, mathematics, biology and academic medicine at both leading US and European universities. Besides NIH-funded awards, he has served as the PI in a multi-center CTSI translational research award and in several NYSTAR-funded public-private research projects with leading industry partners. Educational Commission for Foreign Medical Graduates (ECFMG) Certificate | U.S.A.
DSouza AM, Abidin AZ, Chockanathan U, Schifitto G, Wismüller A. "Mutual connectivity analysis of resting-state functional MRI data with local models." NeuroImage.. 2018 Sep 0; 178:210-223. Epub 2018 May 17. Abidin AZ, Deng B, DSouza AM, Nagarajan MB, Coan P, Wismüller A. "Deep transfer learning for characterizing chondrocyte patterns in phase contrast X-Ray computed tomography images of the human patellar cartilage." Computers in biology and medicine.. 2018 Apr 1; 95:24-33. Epub 2018 Feb 09. Adora M. DSouza; Anas Z. Abidin; Udaysankar Chockanathan; Axel Wismüller. "Regional autonomy changes in resting-state functional MRI in patients with HIV associated neurocognitive disorder". Proc. of SPIE - the International Society for Optical Engineering. 2018; 10574.